Recipes and pictures compliments of my brother in law Q Longno. He also likes to take pictures of the food he cooks so I asked my sister for the recipe so I could post it to share. 1. Saute chicken with ginger, garlic and onion. 2. Add water then add rice upon boiling. When chicken is tender remove from pot. 3. Cook rice. Make sure rice is very tender also. 4. Add Rufina patis, turmeric powder. 5. When rice is done add cooked chicken. Season with salt and pepper. 6. Sprinkle fried garlic and scalions. You could also add boiled egg. Pretty easy recipe right? Thank's Q....looking forward for more of your recipe. Very nice presentation of your brod. in law! And you said they adopted recipe from Luna's restos? Got to visit thi place. I'll check jorp's map for location. Yes, it is, Cecil! Manamit gid ya ang aton aroz caldo compared to other styles. Lee final countdown na gid? All pack and ready to go na gid ay. In case you get busy and won't remember me and Natie, te have fun nalang sa P.I. and remember we are just here waiting for you and all your stories. Take care! 12:15 a.m. of Dec. 4 but in reality, that's already Dec. 5th. That's where I got confused! Anyways, you guys will be always in my mind during my trip! Hold your breaths!! You have a grand vacation in Pinas. Thanks, Cecil! I'm just starting to. 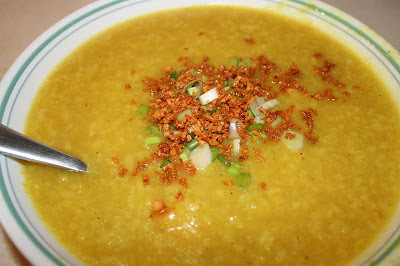 WOW picture pa lang nagalaway na ako.damu2 gid garlic topping.my favorite. i forgot if i placed luna's arroz caldo in my map but its beside GAISANO CITY sa la paz.